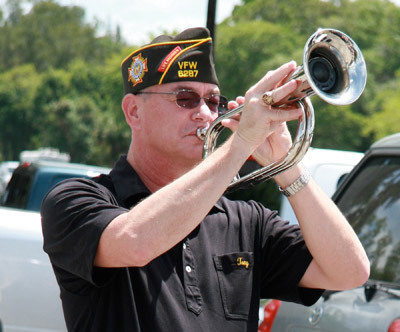 Tony Zipperer plays for the Memorial Day ceremony honoring departed soldiers. Lisa Stark photos. 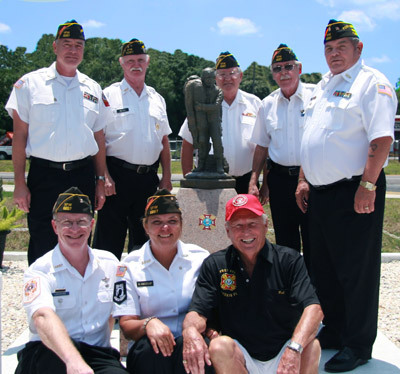 There’s a newly installed bronze statue that can be seen in front of the white building on U.S. 41 that depicts a soldier carrying a fallen comrade over his shoulder, an image that exemplifies the spirit of this Memorial Day at the Ruskin VFW Post 6287. As families and friends enjoyed barbecues, picnics and other activities over the holiday weekend, others chose to celebrate with more solemn remembrances of the day. On Saturday, the new Veterans of Foreign Wars officers were installed at a ceremony and luncheon led by Commander Ron Smith and House Committee chairman Tony Zipperer. Attendees took a moment to pause and reflect on the past and to look forward to a hopeful future. “Memorial weekend is our kick-off for summer and beyond,” said Smith, who also officiated at the traditional flag-raising ceremony on Monday, honoring those servicemen and servicewomen killed in battle. Commander Ron Smith pays tribute to American soldiers killed in battle. In addition to honoring soldiers who have passed, the VFW Ladies Auxiliary is vitally active in the local community, assisting military families in a variety of ways. Each month, they visit the James A. Haley VA hospital in Tampa, where they conduct Bingo, cook food and hold birthday and holiday parties. New officers, seated, from left: Steve Latchford, Julie Blankenship and Bob Moorehead. Standing: Tony Zipperer, George Hilton, Charles Bonney, Richard Bell and Ron Smith. Latchford agreed. “VFW encourages patriotism through many different community programs,” he said, including the funding of scholarships, conducting memorial services for veterans’ families, negotiating for veterans’ benefits, and visiting the sick and injured in VA hospitals. “We have veterans from World War II, the Korean War, Vietnam and Desert Storm, and we work to preserve the memory of our soldiers and assist their families who may be struggling through hard times,” he said. “I can’t thank you enough for all you’ve done for me and my family this year,” said James Replogle, who was one such veteran in need. Post 6287 helped mediate his VA medical benefits, and paid for transportation, housing and even Christmas gifts for his kids at a time when his family was in crisis. “You have always been there for us, and one day, I will be there for you guys,” said Replogle. 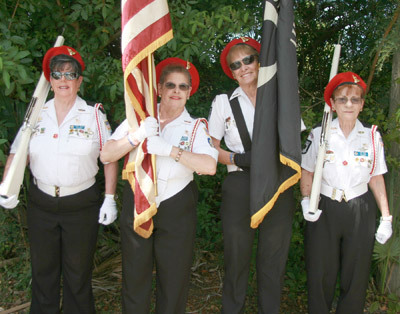 Ladies Auxiliary Color Guard, from left: Nancy Rennie, Shirley Turner, Shirley May and Pat Sims. The new officers will begin their duties in June and include: Steve Latchford, commander; Julie Blankenship, junior vice commander; Bob Moorehead, trustee; Tony Zipperer, house committee chairman; George Hilton, chaplain; Charles Bonney, service officer; and Richard Bell, quartermaster. The Men’s Auxiliary officers are: Randall Harrell, president; Bob Cain, senior vice president; Dale McCane, treasurer; Will Talenti, trustee; and James Shahan, trustee. The Ladies’ Auxiliary officers are: Dianna Gorby, president; Donna Wheeler, treasurer; Lois McBride, senior vice president; Margie Galbreath, chaplain; and Stacy Lemke, trustee. 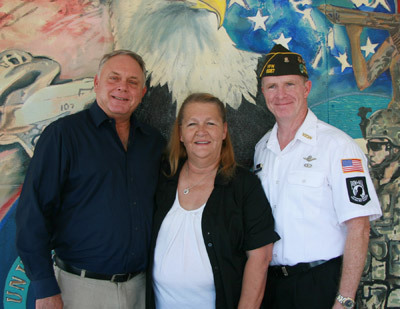 From left: Randall Harrell, Dianna Gorby and Steve Latchford. 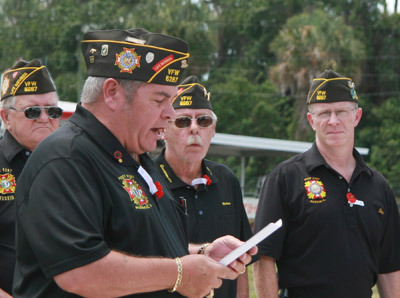 The VFW’s activities are numerous and varied, and include notable community events such as the Ruskin Veterans Day Parade in November, which is attended by thousands. Post 6287 raises money through events like Tuesday Night Bingo, Friday Night Fish Fry, Sunday Morning Breakfast, special holiday events, and weekly live entertainment. Upcoming in June is the annual Father’s Day Breakfast, which is free for all veterans. VFW Post 6287 is located at 5120 U.S. 41 N. in Ruskin. A complete calendar of events can be found on their website at vfwpost6287.com. 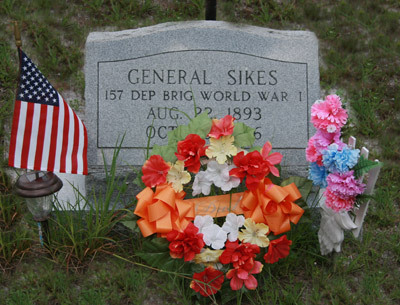 The Ladies’ Auxiliary decorated veterans’ graves for Memorial Day at Ruskin Cemetery. VFW posts around the country are encouraging more female veterans to become involved in their local chapters to aid in community activities benefiting women, says Commander-elect Steve Latchford. 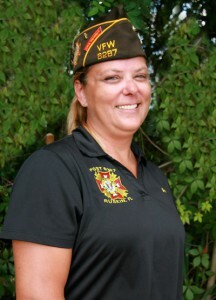 This “female focus” can be seen in VFW members like Julie Blankenship, junior vice commander of Post 6287, who served four years’ active duty in the U.S. Army during Desert Storm. Throughout American history, thousands of women served as nurses, aides and in other support roles in the military. In the American Civil War, there was a handful of women who cross-dressed as men in order to fight. More recently, in the1970s, the U.S. began to admit women to serve active duty in all of its military branches. During the Gulf War and Desert Storm operations, more than 40,000 American women were deployed, but none were able to take on any form of combat. Today, women are able to serve in 95 percent of all Army occupations, and in the Air Force, 99 percent of career fields are open to women. Female U.S Army soldiers are being asked to take part in new training courses designed to equip them for tasks such as biometrics, forensics, tactical questioning and vehicle and personnel searches, opening up thousands of front-line positions for women. As women become more fully integrated into all roles of the military, female involvement in veteran activities on the homefront will also become much more prevalent and vital in organizations such as the VFW.